This week on "Off The Cuff," Justin, Megan, and Allie recap Education Secretary Betsy DeVos's recent appearances before both the House and Senate appropriations subcommittees focused on education funding. Allie gives a report on the latest news from negotiated rulemaking, where committee members are attempting to reach consensus on a number of issues, including accreditation, distance education, faith-based entities, and the TEACH Grant program. 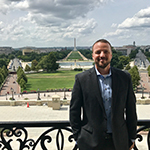 Plus, Megan and Justin share updates from the NASFAA Board of Directors' recent trip to Washington, D.C., during which they discussed with Department of Education officials the increase in reported combat pay on the FAFSA that many schools have observed for the 2019-20 award year and forthcoming changes to the FSA ID. Skip to 9:18 to get straight to the policy discussion.